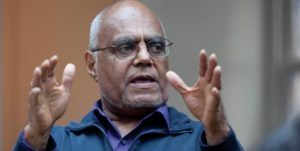 Distinguished writer and civil rights activist Robert “Bob” Moses will speak at Clark University at 4 p.m. Thursday, October 8, in Razzo Hall in the Traina Center for the Arts, 92 Downing Street. Part of the President’s Lecture Series at Clark University, “‘We’: The Two-Letter Pronoun that Confounds the Nation,” is free and open to the public. It also will mark the launch of the Robert J.S. Ross Social Justice Internship. Moses served as a field secretary for the Student Non-Violent Coordinating Committee (SNCC) of the Civil Rights Movement. In 1961 he initiated SNCC’s Mississippi Voter Registration Project and was appointed committee director in 1962. He helped lead the Council of Federated Organizations into the Mississippi Summer Project (1964 Freedom Summer), which introduced the Mississippi Freedom Democratic Party to the National Democratic Convention. Moses is founder and president of Algebra Project, Inc., a national nonprofit organization that uses mathematics as an organizing tool to ensure quality public school education for every child in America. The Algebra Project has worked with cohorts of high school students who previously performed in the lowest quartile of standardized exams and proposes a “benchmark” for them: to graduate high school on time, in four years, ready to do college math for college credit. Moses is co-author of “Radical Equations—Civil Rights from Mississippi to the Algebra Project” (Beacon Press, 2001) and co-editor of “Quality Education as a Constitutional Right: Creating a Grassroots Movement to Transform Public Schools” (Beacon Press, 2010). Moses was the Distinguished Visitor for the Center for African American Studies at Princeton University and has been a visiting lecturer at NYU School of Law. He received his B.A. from Hamilton College (1956) and his master’s in philosophy from Harvard University (1957). He was awarded an honorary Doctor of Science from Harvard University in 2006. He received a MacArthur Foundation Fellowship from 1982 to 1987. The President’s Lecture Series was established in 2002 and consists of several lectures each year by eminent speakers in the sciences, arts, humanities and international relations. Lectures are free and open to the public. Ensuring the Clark legacy of sociology Professor Robert J.S. “Bob” Ross, alumni, colleagues, friends and family created a permanent endowment for the Robert J. S. Ross Social Justice Fund. The endowment supports stipends for undergraduate social justice internships with an organization or other entity whose principal mission is to promote social, economic or environmental justice. The following departments at Clark University join the office of President David P. Angel in support of this lecture: Sociology; Education; History; Math and Computer Science; and Political Science.